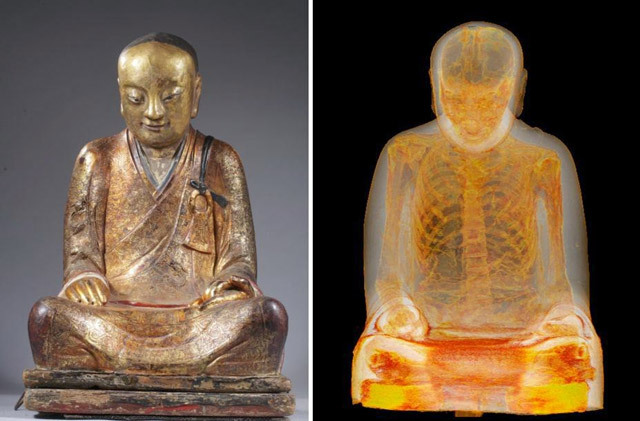 A CT scan has revealed the mummified remains of a monk inside a 1,000-year-old Chinese Buddha statue with paper scraps in place of his organs. 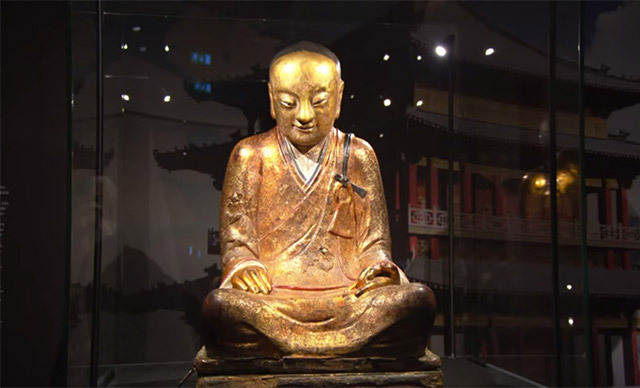 A recent CT scan of a 1,000-year-old Buddha statue has revealed the mummified remains of a Chinese monk believed to have died around 1100 AD. An endoscopic examination of the thoracic and abdominal cavities revealed scraps of paper with Chinese writing were used to replace the organs. 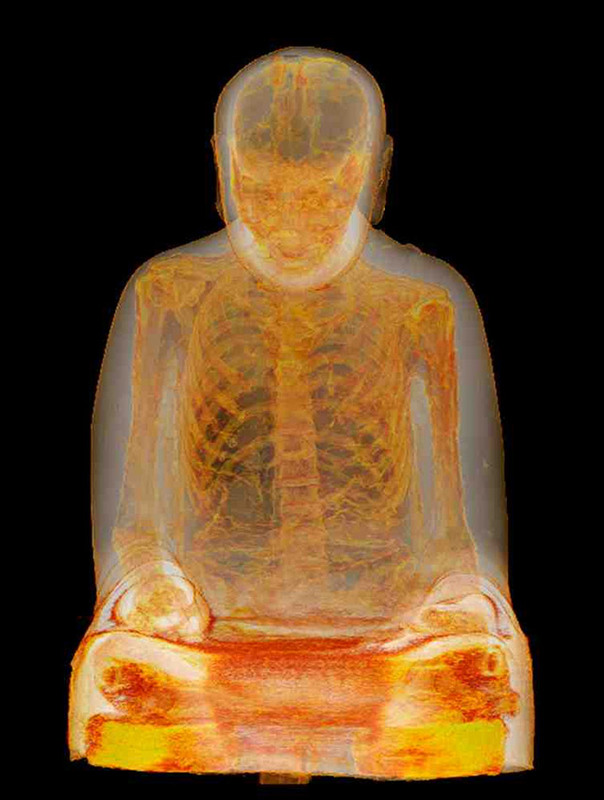 Researchers suggest this may be a case of self-mummification, a long and gruesome process that, if done successfully, would elevate a monk to Buddha status for worship. The most well-known cases of self-mummification are the Japanese sokushinbutsu, though it was also practiced in China and India as far back as the 12th century. The slow, 3,000-day process of mummifying oneself to death involved a diet of things like nuts, seeds, bark and roots, as well as extensive physical activity to starve the body of nutrients and eliminate fat and moisture. A poisonous tea made from the sap of the Urushi tea would induce vomiting to expel body fluids, and serve to kill bacteria and maggots that cause decay after death. The monk would then lock himself in a tomb just large enough to hold his body. Seated in the lotus position, he would enter a state of meditation from which he would not awake. A tube would provide air, and he would ring a bell every day to signal he was still alive. When the bell stopped ringing, the tube was removed and the tomb sealed. It was opened again after 1,000 days to see if the self-mummification ritual had been successful. If the monk was found preserved, it was believed he had achieved a death-like trance and would be placed in a temple for worship until it was time for him to reawaken. I think the story was describing the Japanese process that has been recorded. The article did not seem to imply anyone knows the details on how this particular monk was enshrined. It is most likely this monk’s remains were intentionally prepared to be placed inside this statue in a ritualized process. It seems the background on this statue is largely unknown. How did they get him inside of the bronze statue in perfect position? At what point do they replace the organs? 1000 days? What does the paper say? This seems to me to be a contradiction to all the Buddhist teachings. Meditation was essential but dying for the practice is aberration of the teachings. This monk has engaged a form of extreme asceticism, which was abandoned by Buddha after he realized that it doesn’t help, but on the contrary, hinders the development of wisdom and compassion. Most modern Bodhisattvas I know take care of themselves and others as well as they can. In this way they serve as examples for others and inspire them to embrace and better understand the teachings of Buddha. There is no karmic value to an ascetic death. Like Christianity there are many different Buddhist sects. Sokushinbutsu is one that does this. I believe you can train your body, because I trained my body to wake up every morning for work at 6am because I couldn’t stsnd hearing the alarm. My dogs know what time to eat, everydat at 4pm they are stirring at me and dancing around, which I call it, The Dinner Dance, waiting to get feed. ???? WHY do I ever read the comment section. Such semantic driven idiots who want to be unimpressed. Just enjoy reading about amazing things you will never do because you will never have the courage, willpower, control over your own body, control over your own mind, or faith that someone else roughly 1000 years ago had. They basically commit suicide in order to be worshiped? Wtf? Still interesting. This guy was obviously stoned. If he entered a state of meditation in which he would not awaken, how the hell could he ring a bell everyday? That’s why they wait for the Bell to stop being rung. Staying in a meditative state for 24 hours only to awaken for one simple task would not of been difficult for them. They’d been training their body for this their entire lives. Have you ever shut off your alarm clock and still awoken on time or even early?